Is Obama the new FDR? The answer is no. FDR seized legislative authority. The bills that Congress passed in his first 100 days and beyond were produced by the Roosevelt administration and ratified reflexively by Congress. When F.D.R. took over the Presidency in 1933, the Democrats controlled 64 percent of the Senate seats and 73 percent (!) of the House seats, counting independents who were sympathetic to the party. And those numbers only increased over the next couple of midterms — during their peak during 1937-38, the Demorats actually controlled about 80 percent (!) of the seats in both chambers. Obama, by contrast, came into his term with 59 percent majorities in both chambers. That’s not much to complain about by the standards of recent Presidencies, but is nevertheless a long way from where F.D.R. stood during his first two terms, or for that matter where L.B.J.’s numbers were during the 1965-66 period, when the bulk of the Great Society programs were implemented. F.D.R. and L.B.J. might have been great cleanup hitters — and you’ll get no argument from me that Obama’s aptitude at shepherding his agenda through Congress has been mixed, at best. But they basically spent the first several years of their Presidencies playing in the Congressional equivalent of Coors Field. 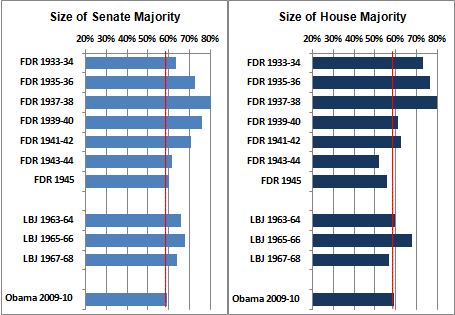 Considering how dramatic the impact of the loss of just one Senate seat has been on both the perception and the reality of Obama’s agenda, that needs to be kept in mind when drawing the comparison.